Kevlar is a heat-resistant and strong synthetic fiber, related to other aramids such as Nomex and Technora. Developed by Stephanie Kwolek at DuPont in 1965, this high-strength material was first commercially used in the early 1970s as a replacement for steel in racing tires. Typically it is spun into ropes or fabric sheets that can be used as such or as an ingredient in composite material components. Kevlar has many applications, ranging from bicycle tires and racing sails to bulletproof vests, because of its high tensile strength-to-weight ratio; by this measure it is five times stronger than steel. It is also used to make modern marching drumheads that withstand high impact. When used as a woven material, it is suitable for mooring lines and other underwater applications. A similar fiber called Twaron with the same chemical structure was developed by Akzo in the 1970s; commercial production started in 1986, and Twaron is now manufactured by Teijin. Poly-paraphenylene terephthalamide – branded Kevlar – was invented by Polish-American chemist Stephanie Kwolek while working for DuPont, in anticipation of a gasoline shortage. In 1964, her group began searching for a new lightweight strong fiber to use for light but strong tires. The polymers she had been working with at the time, poly-p-phenylene-terephthalate and polybenzamide, formed liquid crystal while in solution, something unique to those polymers at the time. The solution was "cloudy, opalescent upon being stirred, and of low viscosity" and usually was thrown away. However, Kwolek persuaded the technician, Charles Smullen, who ran the spinneret, to test her solution, and was amazed to find that the fiber did not break, unlike nylon. Her supervisor and her laboratory director understood the significance of her accidental discovery and a new field of polymer chemistry quickly arose. By 1971, modern Kevlar was introduced. However, Kwolek was not very involved in developing the applications of Kevlar. 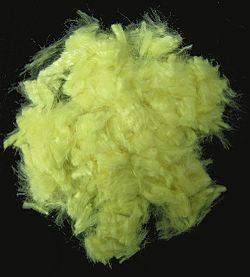 Kevlar is synthesized in solution from the monomers 1,4-phenylene-diamine (para-phenylenediamine) and terephthaloyl chloride in a condensation reaction yielding hydrochloric acid as a byproduct. The result has liquid-crystalline behavior, and mechanical drawing orients the polymer chains in the fiber's direction. Hexamethylphosphoramide (HMPA) was the solvent initially used for the polymerization, but for safety reasons, DuPont replaced it by a solution of N-methyl-pyrrolidone and calcium chloride. As this process had been patented by Akzo (see above) in the production of Twaron, a patent war ensued. Kevlar (poly paraphenylene terephthalamide) production is expensive because of the difficulties arising from using concentrated sulfuric acid, needed to keep the water-insoluble polymer in solution during its synthesis and spinning. Kevlar K-29 – in industrial applications, such as cables, asbestos replacement, brake linings, and body/vehicle armor. Kevlar K49 – high modulus used in cable and rope products. The ultraviolet component of sunlight degrades and decomposes Kevlar, a problem known as UV degradation, and so it is rarely used outdoors without protection against sunlight. 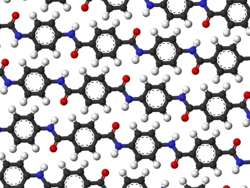 Molecular structure of Kevlar: bold represents a monomer unit, dashed lines indicate hydrogen bonds. When Kevlar is spun, the resulting fiber has a tensile strength of about 3,620 MPa, and a relative density of 1.44. The polymer owes its high strength to the many inter-chain bonds. These inter-molecular hydrogen bonds form between the carbonyl groups and NH centers. Additional strength is derived from aromatic stacking interactions between adjacent strands. These interactions have a greater influence on Kevlar than the van der Waals interactions and chain length that typically influence the properties of other synthetic polymers and fibers such as Dyneema. The presence of salts and certain other impurities, especially calcium, could interfere with the strand interactions and care is taken to avoid inclusion in its production. Kevlar's structure consists of relatively rigid molecules which tend to form mostly planar sheet-like structures rather like silk protein. Kevlar maintains its strength and resilience down to cryogenic temperatures (−196 °C); in fact, it is slightly stronger at low temperatures. At higher temperatures the tensile strength is immediately reduced by about 10–20%, and after some hours the strength progressively reduces further. For example: enduring 160 °C (320 °F) for 500 hours, reduces strength by about 10%; and enduring 260 °C (500 °F) for 70 hours, reduces strength by about 50%. Kevlar is often used in the field of cryogenics for its low thermal conductivity and high strength relative to other materials for suspension purposes. It is most often used to suspend a paramagnetic salt enclosure from a superconducting magnet mandrel in order to minimize any heat leaks to the paramagnetic material. It is also used as a thermal standoff or structural support where low heat leaks are desired. Kevlar is a well-known component of personal armor such as combat helmets, ballistic face masks, and ballistic vests. The PASGT helmet and vest used by United States military forces, use Kevlar as a key component in their construction. Other military uses include bulletproof face masks and spall liners used to protect the crews of armoured fighting vehicles. 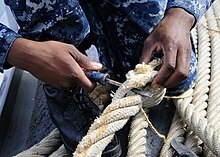 Nimitz-class aircraft carriers use Kevlar reinforcement in vital areas. Civilian applications include: high heat resistance uniforms worn by firefighters, body armour worn by police officers, security, and police tactical teams such as SWAT. Kevlar is used to manufacture gloves, sleeves, jackets, chaps and other articles of clothing designed to protect users from cuts, abrasions and heat. Kevlar-based protective gear is often considerably lighter and thinner than equivalent gear made of more traditional materials. Kevlar is a very popular material for racing canoes. It is used for motorcycle safety clothing, especially in the areas featuring padding such as shoulders and elbows. In fencing it is used in the protective jackets, breeches, plastrons and the bib of the masks. It is increasingly being used in the peto, the padded covering which protects the picadors' horses in the bullring. Speed skaters also frequently wear an under-layer of Kevlar fabric to prevent potential wounds from skates in the event of a fall or collision. In kyudo, or Japanese archery, it may be used as an alternative to more expensive hemp for bow strings. It is one of the main materials used for paraglider suspension lines. It is used as an inner lining for some bicycle tires to prevent punctures. In table tennis, plies of Kevlar are added to custom ply blades, or paddles, in order to increase bounce and reduce weight. Tennis racquets are sometimes strung with Kevlar. It is used in sails for high performance racing boats. In 2013, with advancements in technology, Nike used Kevlar in shoes for the first time. It launched the Elite II Series, with enhancements to its earlier version of basketball shoes by using Kevlar in the anterior as well as the shoe laces. This was done to decrease the elasticity of the tip of the shoe in contrast to nylon used conventionally as Kevlar expanded by about 1% against nylon which expanded by about 30%. Shoes in this range included LeBron, HyperDunk and Zoom Kobe VII. However these shoes were launched at a price range much higher than average cost of basketball shoes. It was also used in the laces for the Adidas F50 adiZero Prime football boot. Several companies, including Continental AG, manufacture cycle tires with Kevlar to protect against punctures. Folding-bead bicycle tires, introduced to cycling by Tom Ritchey in 1984, use Kevlar as a bead in place of steel for weight reduction and strength. A side effect of the folding bead is a reduction in shelf and floor space needed to display cycle tires in a retail environment, as they are folded and placed in small boxes. Kevlar has also been found to have useful acoustic properties for loudspeaker cones, specifically for bass and mid range drive units. Additionally, Kevlar has been used as a strength member in fiber optic cables such as the ones used for audio data transmissions. Kevlar can be used as an acoustic core on bows for string instruments. Kevlar's physical properties provide strength, flexibility, and stability for the bow's user. To date, the only manufacturer of this type of bow is CodaBow. Kevlar is also presently used as a material for tailcords (a.k.a. tailpiece adjusters), which connect the tailpiece to the endpin of bowed string instruments. Kevlar is sometimes used as a material on marching snare drums. It allows for an extremely high amount of tension, resulting in a cleaner sound. There is usually a resin poured onto the Kevlar to make the head airtight, and a nylon top layer to provide a flat striking surface. This is one of the primary types of marching snare drum heads. Remo's Falam Slam patch is made with Kevlar and is used to reinforce bass drum heads where the beater strikes. Kevlar is used in the woodwind reeds of Fibracell. The material of these reeds is a composite of aerospace materials designed to duplicate the way nature constructs cane reed. Very stiff but sound absorbing Kevlar fibers are suspended in a lightweight resin formulation. The chopped fiber has been used as a replacement for asbestos in brake pads. Dust produced from asbestos brakes is toxic, while aramids are a benign substitute. Wicks for fire dancing props are made of composite materials with Kevlar in them. Kevlar by itself does not absorb fuel very well, so it is blended with other materials such as fiberglass or cotton. Kevlar's high heat resistance allows the wicks to be reused many times. Kevlar is sometimes used as a substitute for Teflon in some non-stick frying pans. The fiber is used in woven rope and in cable, where the fibers are kept parallel within a polyethylene sleeve. The cables have been used in suspension bridges such as the bridge at Aberfeldy in Scotland. They have also been used to stabilize cracking concrete cooling towers by circumferential application followed by tensioning to close the cracks. Kevlar is widely used as a protective outer sheath for optical fiber cable, as its strength protects the cable from damage and kinking. When used in this application it is commonly known by the trademarked name Parafil. Kevlar was used by scientists at Georgia Institute of Technology as a base textile for an experiment in electricity-producing clothing. This was done by weaving zinc oxide nanowires into the fabric. If successful, the new fabric will generate about 80 milliwatts per square meter. A retractable roof of over 60,000 square feet (5,575 square metres) of Kevlar was a key part of the design of Montreal's Olympic stadium for the 1976 Summer Olympics. It was spectacularly unsuccessful, as it was completed 10 years late and replaced just 10 years later in May 1998 after a series of problems. Kevlar can be found as a reinforcing layer in rubber bellows expansion joints and rubber hoses, for use in high temperature applications, and for its high strength. It is also found as a braid layer used on the outside of hose assemblies, to add protection against sharp objects. A thin Kevlar window has been used by the NA48 experiment at CERN to separate a vacuum vessel from a vessel at nearly atmospheric pressure, both 192 cm in diameter. The window has provided vacuum tightness combined with reasonably small amount of material (only 0.3% to 0.4% of radiation length). The Motorola RAZR Family, the Motorola Droid Maxx, and the OnePlus 2 have a Kevlar backplate, chosen over other materials such as carbon fiber due to its resilience and lack of interference with signal transmission. The Kevlar fiber/epoxy matrix composite materials can be used in marine current turbines (MCT) or wind turbines due to their high specific strength and light weight compared to other fibers. Aramid fibers are widely used for reinforcing composite materials, often in combination with carbon fiber and glass fiber. The matrix for high performance composites is usually epoxy resin. Typical applications include monocoque bodies for F1 racing cars, helicopter rotor blades, tennis, table tennis, badminton and squash rackets, kayaks, cricket bats, and field hockey, ice hockey and lacrosse sticks. Kevlar is an alternative in certain parts of light aircraft construction. The wing leading edge is one application, Kevlar being less prone than carbon or glass fiber to break in bird collision. ^ Mera, Hiroshi; Takata, Tadahiko (2000). "High-Performance Fibers". Ullmann's Encyclopedia of Industrial Chemistry. doi:10.1002/14356007.a13_001. ISBN 978-3527306732. ^ a b "What is Kevlar". DuPont. Retrieved 2007-03-28. ^ "Wholly aromatic carbocyclic polycarbonamide fiber having orientation... - US 3819587 A - IP.com". ip.com. ^ a b c "Inventing Modern America: Insight — Stephanie Kwolek". Lemelson-MIT program. Archived from the original on May 24, 2009. Retrieved May 24, 2009. 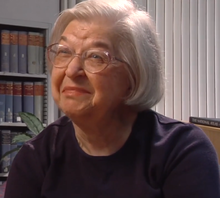 ^ Stephanie Louise Kwolek Biography. Bookrags. Archived from the original on May 24, 2009. Retrieved May 24, 2009. ^ Quinn, Jim. "I was able to be Creative and work as hard as I wanted". American Heritage Publishing. Archived from the original on May 24, 2009. Retrieved May 24, 2009. ^ How Kevlar® works: a simple introduction. Explainthatstuff.com (2009-12-07). Retrieved on 2012-05-26. ^ Kevlar KM2 Technical Description. dupont.com. Retrieved on 2012-05-26. ^ Yousif, Emad; Haddad, Raghad (2013-08-23). "Photodegradation and photostabilization of polymers, especially polystyrene: review". SpringerPlus. 2: 398. doi:10.1186/2193-1801-2-398. ISSN 2193-1801. PMC 4320144. PMID 25674392. ^ Quintanilla, J. (1990). "Microstructure and properties of random heterogeneous materials : a review of theoretical results". Polymer Engineering and Science. 39: 559–585. ^ KEVLAR Technical Guide. dupont.com. Retrieved on 2012-05-26. ^ Kevlar – DuPont Personal Protection. .dupont.com. Retrieved on 2012-05-26. ^ Genzini, Luigi. "KYUDO – THE WAY OF THE BOW ; The art of shooting the traditional Japanese bow according to the HEKI INSAI HA SCHOOL" (PDF). ^ "Nike Basketball's ELITE Series 2.0 Rises Above the Rest". Nike News. March 20, 2013. Retrieved April 16, 2017. ^ "SafetySystem Breaker". www.continental-tires.com. Retrieved 2019-02-25. ^ Audio speaker use. Audioholics.com (2009-07-23). Retrieved on 2012-05-26. ^ carbon fiber bows for violin, viola, cello and bass Archived 2011-11-10 at the Wayback Machine. CodaBow. Retrieved on 2012-05-26. ^ carbon fiber bows for violin, viola, cello and bass Archived 2012-03-09 at the Wayback Machine. CodaBow. Retrieved on 2012-05-26. ^ Tailpieces and Tailcords Archived 2012-11-23 at the Wayback Machine Aitchison Mnatzaganian cello makers, restorers and dealers. Retrieved on 2012-12-17. ^ "Superstar Kevlar Compound disc brake pads review". BikeRadar. Retrieved 2016-10-23. ^ T., JAFFREY, S. A. M.; P., ROOD, A.; M., SCOTT, R. (1992-04-01). "FIBROUS DUST RELEASE FROM ASBESTOS SUBSTITUTES IN FRICTION PRODUCTS". The Annals of Occupational Hygiene. 36 (2). doi:10.1093/annhyg/36.2.173. ISSN 0003-4878. ^ Fabric Produces Electricity As You Wear It. Scientific American (2008-02-22). Retrieved on 2012-05-26. ^ Clem's Baseball ~ Olympic Stadium. Andrewclem.com. Retrieved on 2012-05-26. ^ Shepherd, Robert; Stokes, Adam; Nunes, Rui; Whitesides, George (October 2013). "Soft Machines That are Resistant to Puncture and That Self Seal" (PDF). Advanced Materials. 25 (46): 6709–6713. doi:10.1002/adma.201303175. PMID 24123311. ^ Meyer, Bruce (November 9, 2015). "Unaflex adding space, capacity at S.C. plant". Rubber & Plastics News. 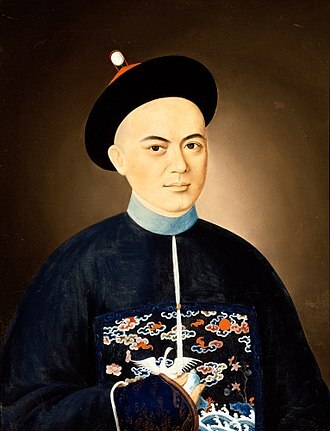 ^ Wang, Jifeng; Norbert Müller (December 2011). "Numerical investigation on composite material marine current turbine using CFD". Central European Journal of Engineering. 1 (4): 334–340. Bibcode:2011CEJE....1..334W. doi:10.2478/s13531-011-0033-6. ^ D. Tanner; J. A. Fitzgerald; B. R. Phillips (1989). "The Kevlar Story – an Advanced Materials Case Study". Angewandte Chemie International Edition in English. 28 (5): 649–654. doi:10.1002/anie.198906491. 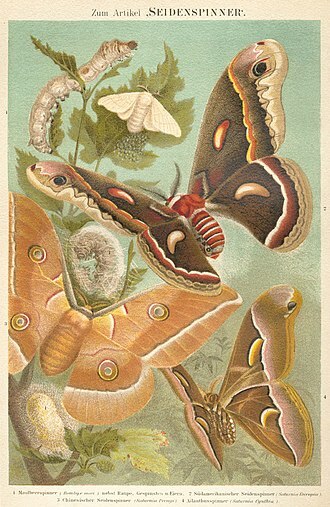 ^ E. E. Magat (1980). "Fibers from Extended Chain Aromatic Polyamides, New Fibers and Their Composites". Philosophical Transactions of the Royal Society A. 294 (1411): 463–472. Bibcode:1980RSPTA.294..463M. doi:10.1098/rsta.1980.0055. JSTOR 36370. ^ Ronald V. Joven. Manufacturing Kevlar panels by thermo-curing process. Los Andes University, 2007. Bogotá, Colombia. Wikimedia Commons has media related to Aramids. In chemistry, a salt is an ionic compound that results from the neutralization reaction of an acid and a base. Salts are composed of related numbers of cations and anions so that the product is electrically neutral and these component ions can be inorganic, such as chloride, or organic, such as acetate, and can be monatomic, such as fluoride, or polyatomic, such as sulfate. There are several varieties of salts, salts that hydrolyze to produce hydroxide ions when dissolved in water are alkali salts, whilst those that hydrolyze to produce hydronium ions in water are acidic salts. Neutral salts are those salts that are neither acidic nor basic, zwitterions contain an anionic centre and a cationic centre in the same molecule, but are not considered to be salts. Examples of zwitterions include amino acids, many metabolites, usually, non-dissolved salts at standard conditions for temperature and pressure are solid, but there are exceptions. Molten salts and solutions containing dissolved salts are called electrolytes, as they are able to conduct electricity. As observed in the cytoplasm of cells, in blood, plant saps and mineral waters, their salt content is given for the respective ions. Salts can appear to be clear and transparent and even metallic, in many cases, the apparent opacity or transparency are only related to the difference in size of the individual monocrystals. 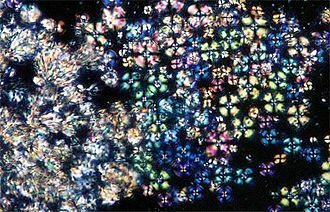 Since light reflects from the boundaries, larger crystals tend to be transparent. The color of the salt is due to the electronic structure in the d-orbitals of transition elements or in the conjugated organic dye framework. Different salts can elicit all five basic tastes, e. g. salty, sour and umami or savory. Salts of strong acids and strong bases are non-volatile and odorless and that slow, partial decomposition is usually accelerated by the presence of water, since hydrolysis is the other half of the reversible reaction equation of formation of weak salts. Many ionic compounds can be dissolved in water or other similar solvents, the exact combination of ions involved makes each compound have a unique solubility in any solvent. Nylon is a generic designation for a family of synthetic polymers, more specifically aliphatic or semi-aromatic polyamides. They can be melt-processed into fibers, films or shapes, the first example of nylon was produced on February 28,1935, by Wallace Carothers at DuPonts research facility at the DuPont Experimental Station. Nylon polymers have significant commercial applications in fibers, in shapes. Nylon is made of repeating units linked by bonds and is a type of polyamide and is frequently referred to as such. Nylon was the first commercially successful synthetic thermoplastic polymer, nylon polymer is made by reacting monomers which are either lactams, acid/amines or stoichiometric mixtures of diamines and diacids. Mixtures of these can be polymerized together to make copolymers, Nylon polymers can be mixed with a wide variety of additives to achieve many different property variations. Nylon was invented accidentally by Julian W. Hill, a chemist for DuPont under Wallace Carotherss supervision and it was only given this name at the 1939 New York Worlds Fair. The patents were owned by DuPont, Nylon was intended to be a synthetic replacement for silk and substituted for it in many different products after silk became scarce during World War II. It replaced silk in military applications such as parachutes and flak vests, after initial commercialization of nylon as a fiber, applications in the form of shapes and films were developed. The main market for nylon shapes now is in auto components, in 1940, John W. Eckelberry of DuPont stated that the letters nyl were arbitrary and the on was copied from the suffixes of other fibers such as cotton and rayon. A publication by DuPont explained that the name was intended to be No-Run. Since the products were not really run-proof, the vowels were swapped to produce nuron, for clarity in pronunciation, the i was changed to y. Most nylons are made from the reaction of an acid with a diamine or a lactam or amino acid with itself. In the first case, the structure is so-called ABAB similar to polyesters and polyurethanes, in the second case, the repeating unit corresponds to the single monomer. It is a heat-resistant and strong synthetic fibre developed in the early 1970s by the Dutch company AKZO, division ENKA, Akzo Industrial Fibers. The research name of the fibre was originally Fiber X. This is a chronology of the development of Twaron, In 1960s a research program starts for Fiber X, in 1972 the ENKA Research laboratory develops a para-aramid called Arenka. In 1973 Akzo decides to use sulfuric acid as a solvent for spinning, in 1976 a pilot plant is built. In 1984 the product is renamed Twaron, in 1986 commercial production is started at five locations and nine plants. In 1987 Twaron is introduced as a commercial product, in 1989 the aramid business of Akzo becomes an independent Business Unit called Twaron BV. Since 2000 Twaron BV is owned by the Teijin Group, now called Teijin Twaron BV and based in Arnhem, the main production facilities for Twaron are in Emmen and Delfzijl. In 2007 Teijin Twaron expands for the time in six years. Twaron is a p-phenylene terephthalamide, the simplest form of the AABB para polyaramide, ppPTA is a product of p-phenylene diamine and terephthaloyl dichloride. To dissolve the aromatic polymer Twaron used a co-solvent of N-methyl pyrrolidone, the invention of this specific process was done in 1974 at AKZO Research Laboratory in Arnhem by a team consisting of Leo Vollbracht, Teun Veerman and Wim Engelhard. The patent of the newly discovered process route led to a patent war between AKZO and DuPont as Dupont initially used the carcinogenic HMPT, despite heavy research DuPont now applies the AKZO patent for their Kevlar process and use the less hazardous NMP. After the production of the Twaron polymer in Delfzijl, the polymer is brought to Emmen, polymer solvent for spinning PPTA is generally 100% anhydrous sulfuric acid. The polymer is dissolved by mixing sulfuric acid in powder form with the polymer in powder form. This process, which differs from the more difficult DuPont process, was invented by Henri Lammers and patented by AKZO. Twaron is a para-aramid and is used in automotive, sport, aerospace and industry applications, e. g. bullet-proof body armor, abington, UK - The Textile Institute. Ultra-high-molecular-weight polyethylene is a subset of the thermoplastic polyethylene. Also known as polyethylene, or high-performance polyethylene, it has extremely long chains. The longer chain serves to transfer load more effectively to the backbone by strengthening intermolecular interactions. This results in a tough material, with the highest impact strength of any thermoplastic presently made. UHMWPE is odorless and nontoxic and it embodies all the characteristics of high-density polyethylene with the added traits of being resistant to concentrated acids and alkalis as well as numerous organic solvents. Its coefficient of friction is lower than that of nylon and acetal, and is comparable to that of polytetrafluoroethylene. Polymerization of UHMWPE was commercialised in the 1950s by Ruhrchemie AG, today UHMWPE powder materials, which may be directly molded into a products final shape, are produced by Ticona, Braskem, DSM and Mitsui. Processed UHMWPE is available either as fibers or in consolidated form. Because of its resistance to wear and impact, UHMWPE continues to find increasing industrial applications, including the automotive, since the 1960s, UHMWPE has been the material of choice for total joint arthroplasty in orthopedic and spine implants. UHMWPE fibers, commercialized in the late 1970s by the Dutch chemical company DSM, are used in ballistic protection, defense applications. UHMWPE is a type of polyolefin and it is made up of extremely long chains of polyethylene, which all align in the same direction. It derives its strength largely from the length of each individual molecule, each chain is bonded to the others with so many van der Waals bonds that the whole of the inter-molecule strength is high. In this way, large tensile loads are not limited as much by the weakness of each van der Waals bond. When formed to fibers, the chains can attain a parallel orientation greater than 95%. In contrast, Kevlar derives its strength from strong bonding between relatively short molecules and its melting point is around 130 to 136 °C, according to DSM, it is not advisable to use UHMWPE fibers at temperatures exceeding 80 to 100 °C for long periods of time. Many natural and synthetic polymers are attacked by ultraviolet radiation, and products using these materials may crack or disintegrate if they are not UV-stable. The problem is known as UV degradation, and is a problem in products exposed to sunlight. Continuous exposure is a serious problem than intermittent exposure, since attack is dependent on the extent. 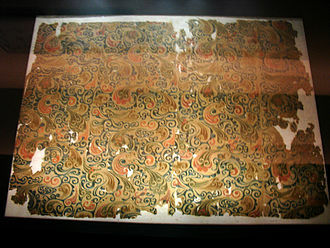 Many pigments and dyes can be affected, and the known as phototendering can affect textiles such as curtains or drapes. Common synthetic polymers that can be attacked include polypropylene and LDPE, ultraviolet rays interact with these bonds to form free radicals, which react further with oxygen in the atmosphere, producing carbonyl groups in the main chain. The exposed surfaces of products may discolour and crack, and in extreme cases, in fibre products like rope used in outdoor applications, product life will be low because the outer fibres will be attacked first, and will easily be damaged by abrasion for example. Discolouration of the rope may occur, thus giving a warning of the problem. Polymers which possess UV-absorbing groups such as aromatic rings may be sensitive to UV degradation, aramid fibres like Kevlar, for example, are highly UV-sensitive and must be protected from the deleterious effects of sunlight. In the example shown at left, carbonyl groups were easily detected by IR spectroscopy from a cast thin film, the product was a road cone made by rotational moulding in LDPE, which had cracked prematurely in service. Many similar cones failed because an anti-UV additive had not been used during processing, other plastic products which failed included polypropylene mancabs used at roadworks which cracked after service of only a few months. UV attack by sunlight can be ameliorated or prevented by adding chemicals to the polymer when mixing the ingredients. UV stabilizers in plastics usually act by absorbing the UV radiation preferentially, the chemicals used are similar to those in sunscreen products, which protect skin from UV attack. Frequently, glass can be an alternative to polymers when it comes to UV degradation. These vests often have a ballistic plate inserted into the vest. Body armor may combine a ballistic vest with other items of protective clothing, Ballistic vests use layers of very strong fibers to catch and deform a bullet, mushrooming it into a dish shape, and spreading its force over a larger portion of the vest fiber. The vest absorbs the energy from the bullet, bringing it to a stop before it can completely penetrate the textile matrix. Some layers may be penetrated but as the bullet deforms, the energy is absorbed by a larger and larger fiber area, while a vest can prevent bullet penetration, the vest and wearer still absorb the bullets impulse. Even without penetration, heavy bullets deal enough force to blunt force trauma under the impact point. Vest specifications will typically include both penetration resistance requirements and limits on the amount of force that is delivered to the body. This is because the force of these objects stays concentrated in a relatively small area. By contrast, stab vests provide better protection against sharp implements, textile vests may be augmented with metal, ceramic or polyethylene plates that provide extra protection to vital areas. These hard armor plates have proven effective against all handgun bullets and these upgraded ballistic vests have become standard in military use, as soft body armor vests are ineffective against military rifle rounds. Prison guards and police often wear vests which are designed specifically against bladed weapons and these vests may incorporate coated and laminated para-aramid textiles or metallic components. In 1538, Francesco Maria della Rovere commissioned Filippo Negroli to create a bulletproof vest, in 1561, Maximilian II, Holy Roman Emperor is recorded as testing his armor against gun-fire. Similarly, in 1590 Sir Henry Lee expected his Greenwich armor to be pistol proof and its actual effectiveness was controversial at the time. The etymology of bullet and the form of proof in the late 16th century would suggest that the term bulletproof originated shortly thereafter. During the English Civil War Oliver Cromwells Ironside cavalry were equipped with Capeline helmets, the outer layer was designed to absorb the bullets energy and the thicker inner layer stopped further penetration. A patent war is a battle between corporations or individuals to secure patents for litigation, whether offensively or defensively. There are ongoing patent wars between the worlds largest technology and software corporations, contemporary patent wars are a global phenomenon, fought by multinational corporations based in the United States, Europe, Japan and Taiwan. Patent wars have occurred in a range of technologies, both in the past and in the present. Patent wars are not a new phenomenon, alexander Graham Bell, credited with inventing the telephone, was dragged into a patent war against his rivals, which involved, in just 11 years,600 lawsuits. One notable case was Bells lawsuit against Western Union, Western Union was backed by Elisha Gray, credited with inventing the telephone. The occurrence of patent wars has been shaped by the digital age, in the 1980s, technology corporations in the United States and Japan engaged in a patent war, creating a scenario where companies were forced to fight patent with patent. This bilateral patent war, partly exaggerated by the media, subsided by the mid 1990s, exacerbating the frequency of patent wars was the advent of patent trolling. The term patent troll was coined in the 1990s by the employees of Intel, during the 1990s, federal courts began reversing earlier decisions made by the patent office that restricted the patenting of software. In 1997, software companies Trend Micro, Integralis, McAffee, in 1999, a patent for one-click ordering technology led to a patent war between Amazon. com and Barnes & Noble. In 2004, Sony and Kodak engaged in a patent war over digital cameras, the current smartphone wars started in the late 2000s. According to PC Magazine, Apple brought the patent wars to the market by its desire to go thermonuclear on Googles competing Android operating system for mobile devices. This triggered a war between major companies in the mobile market. Apple has been accused of having links to the company Digitude Innovations, following this warfare, Apple itself has been called a patent-troll. Spinning is a major part of the textile industry. 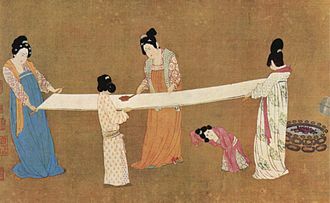 The textiles are fabricated into finished fabrics, home textiles, clothes or other products, there are three industrial processes available to spin yarn, and a handicraft community who use hand spinning techniques. Spinning is the twisting together of drawn out strands of fibres to form yarn, though it is used to describe the process of drawing out, inserting the twist. In simple words, spinning is a process in which we convert fibres by passing through certain processes like blow room, drawing, simplex, ring frame and these yarns are wound onto the cones. Artificial fibres are made by extruding a polymer through a spinneret into a medium where it hardens, wet spinning uses a coagulating medium. In dry spinning, the polymer is contained in a solvent that evaporates in the heated exit chamber, in melt spinning the extruded polymer is cooled in gas or air and sets. All these fibres will be of length, often kilometers long. Natural fibres are either from animals, mineral, or from plants and these vegetable fibres can come from the seed, the stem or the leaf. Without exception, many processes are needed before a clean even staple is obtained – each with a specific name. With the exception of silk, each of these fibres is short, being only centimetres in length, artificial fibres can be processed as long fibres or batched and cut so they can be processed like a natural fibre. Ring-spinning is the most common spinning method in the world, other systems include air-jet and open-end spinning. Open-end spinning is done using break or open-end spinning and this is a technique where the staple fibre is blown by air into a rotor and attaches to the tail of formed yarn that is continually being drawn out of the chamber. Other methods of break spinning use needles and electrostatic forces, the processes to make yarn short-staple yarn are blending, carding, pin-drafting, spinning, and—if desired—plying and dyeing. In long staple spinning, the process may start with stretch-break of tow, in open-end and air-jet spinning, the roving operation is eliminated. The spinning frame winds yarn a bobbin, after this step the yarn is wound to a cone for knitting or weaving. Calcium is a chemical element with symbol Ca and atomic number 20. Calcium is a soft grayish-yellow alkaline earth metal, fifth-most-abundant element by mass in the Earths crust, the ion Ca2+ is the fifth-most-abundant dissolved ion in seawater by both molarity and mass, after sodium, chloride and sulfate. Free calcium metal is too reactive to occur in nature, Calcium is produced in supernova nucleosynthesis. Calcium is a trace element in living organisms. It is the most abundant metal by mass in animals, and it is an important constituent of bone, teeth. In cell biology, the movement of the calcium ion into, Calcium carbonate and calcium citrate are often taken as dietary supplements. Calcium is on the World Health Organizations List of Essential Medicines, Calcium has a wide variety of applications, almost all of which are associated with calcium compounds and salts. Calcium metal is used as a deoxidizer and decarbonizer for production of ferrous and nonferrous alloys. In steelmaking and production of iron, Ca reacts with oxygen, Calcium carbonate is used in manufacturing cement and mortar, lime and aids in production in the glass industry. It has chemical and optical uses as mineral specimens in toothpastes, Calcium hydroxide solution is used to detect the presence of carbon dioxide in a gas sample bubbled through a solution. The solution turns cloudy where CO2 is present, Calcium arsenate is used in insecticides. Calcium carbide is used to make acetylene gas and various plastics, Calcium chloride is used in ice removal and dust control on dirt roads, as a conditioner for concrete, as an additive in canned tomatoes, and to provide body for automobile tires. Calcium citrate is used as a food preservative, Calcium cyclamate is used as a sweetening agent in several countries. In the United States, it has been outlawed as a suspected carcinogen, Calcium gluconate is used as a food additive and in vitamin pills. Calcium hypochlorite is used as a swimming pool disinfectant, as an agent, as an ingredient in deodorant. Calcium permanganate is used in rocket propellant, textile production, as a water sterilizing agent. 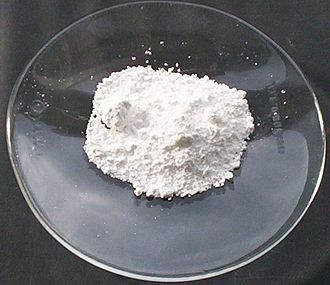 Calcium phosphate is used as a supplement for animal feed, fertilizer, in production for dough and yeast products, in the manufacture of glass. Nomex is a registered trademark for flame-resistant meta-aramid material developed in the early 1960s by DuPont and first marketed in 1967. Nomex and related polymers are related to nylon, but have aromatic backbones. Nomex is the example of a meta variant of the aramids. 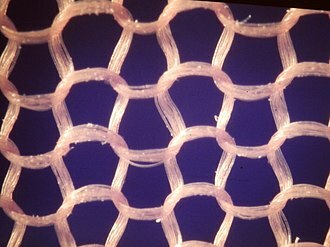 Unlike Kevlar, Nomex cannot align during filament formation and has poorer strength, however, it has excellent thermal and radiation resistance for a polymer material. The polymer is produced by condensation reaction from the monomers m-phenylenediamine and it is sold in both fiber and sheet forms and is used as a fabric wherever resistance from heat and flame is required. Nomex sheet is actually a calendered paper and made in a similar fashion, Nomex Type 410 paper is the original and one of the larger grade types made, mostly for electrical insulation purposes. 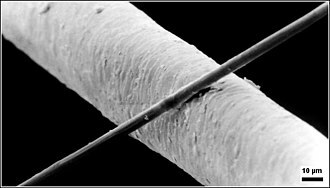 Nomex fiber is made in the United States and in Spain, wilfred Sweeny, the DuPont scientist responsible for discoveries leading to Nomex, earned a DuPont Lavoisier Medal partly for this work in 2002. 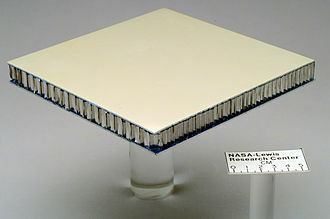 Nomex Paper is used in electrical laminates such as circuit boards, honeycomb structures such as these, as well as mylar-Nomex laminates are used extensively in aircraft construction. Both the firefighting and vehicle racing industries use Nomex to create clothing, a Nomex hood is a common piece of racing and firefighting equipment. It is placed on the head on top of a face mask. The hood protects the portions of the head not covered by the helmet, wildland firefighters wear Nomex shirts and trousers as part of their personal protective equipment during wildfire suppression activities. Military pilots and aircrew wear flight suits made of over 92 percent Nomex to protect them from the possibility of cockpit fires, troops riding in ground vehicles have begun wearing Nomex. The remaining material is typically Kevlar thread used to hold the fabric together at the seams, military tank drivers typically use Nomex hoods as protection against fire and extreme cold. A ceiling canopy of Nomex reflects high and mid frequency sound, providing reverberation, according to RPI President Shirley Ann Jackson, EMPAC is the first venue in the world to use Nomex for acoustic reasons. Concrete is a mixture of cement and aggregate, giving a robust, strong material that is very widely used. Sails made with synthetic fibers. 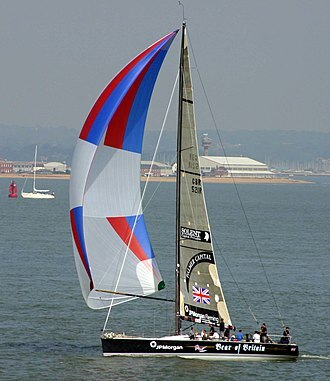 Spinnaker, made of nylon because of its light weight and high strength. Aramid (Kevlar) sails, showing the typical color of the fabric. 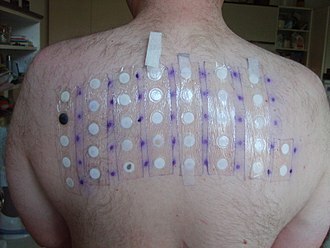 Alignment in a nematic phase. Phase transition between a nematic (left) and smectic A (right) phases observed between crossed polarizers. The black color corresponds to isotropic medium. 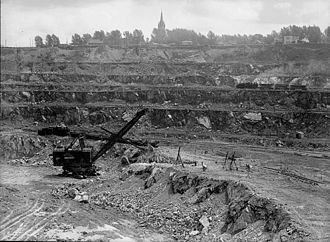 Canada's biggest power shovel loading an ore train with asbestos at the Jeffrey Mine, Johns-Manville Co., Asbestos, Quebec, June 1944. 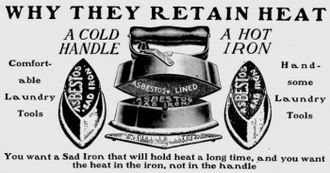 The applications of asbestos multiplied at the end of the 19th century. This is an advertisement for an asbestos-lined clothes iron from 1906. The viscosity of polymer solutions is a valued parameter. Viscometers such as this are employed in such measurements. Portion of backbone of nylon 6,6. Van der Waals forces help geckos walk effortlessly along walls and ceilings, but this ability is mainly due to electrostatic interaction according to a recent study. Rain water flux from a canopy. Among the forces that govern drop formation: van der Waals force, surface tension, cohesion, Plateau–Rayleigh instability. 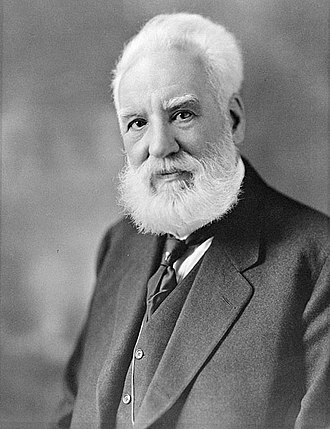 Alexander Graham Bell was involved in a patent war over the invention of the telephone. The chemical structure of the para-phenylene group.